Perhaps part of its allure is the fictional novel format in which it is written, setting it apart from other books focused on explaining a method. The novel starts with its main character, Alex Rogo, struggling to create success for a manufacturing plant making some fictional product and a threat that if they don’t turn the plant around in three months, the plant will be shut down. No matter what Alex and his merry band of managers do to improve productivity, they continue to struggle with meeting customer delivery commitments at a profitable price point. Until Alex fortuitously reconnects with his old physics professor in an airport waiting lounge who offers sage but somewhat obtuse advice, all hope seems to be lost. It is Alex’s struggle to incorporate his mentor’s counsel that leads the reader down an interesting and ‘difficult to put down’ journey to understanding Goldratt’s Theory of Constraints (TOC) methodology. Throughout the novel the author uses subtle devices to help Alex reach cathartic moments to breakthrough seemingly insurmountable roadblocks. Alex is invited to chaperone his son’s Boy Scout camping trip only to find out the troop master is sick and has delegated leadership to Alex. He finds himself surrounded by a dozen or so pre-adolescent boys, all fired up to conquer their days’ milestone, a 10 mile hike in about 5 hours. Just like the factory work cells, the boys have different capacities and speeds, and one such boy (Herbie) turns out to be the troop bottleneck. As they struggle to meet their commitment to achieve the hike length in the prescribed time, Alex has the opportunity to see how Herbie’s placement in the hike order affects the overall goal. Alex and the troop discover ways to ‘exploit’ the constraint, i.e. Herbie. This is done by redistributing the contents of Herbie’s backpack and assuring he is leading the pack which changes the system’s characteristics and allows the troop to traverse their distance and arrive at the destination just in time. The key concepts of focusing on the overall system’s goal, identifying and exploiting constraints (The Five Focusing Steps), and using a systematic approach to improvement (The Thinking Process) all centered on the idea of improving throughput are illustrated throughout the novel. One example included adding automation to the line, a fantastic idea, given the way the factory measured productivity. However, realigning the system to focus on the goal (making money) quickly pointed out that automation actually hurt the system by creating large amounts of inventory downstream at a work cell incapable of processing at the speed necessary to accommodate the throughput offered by the newly acquired automated equipment. Productivity was up, but they still couldn’t deliver product, which in turn meant their profitability suffered. By identifying the downstream constraint, realigning resources to assure the constraining equipment was consistently and constantly busy (exploiting the constraint) and allowing upstream machines to go idle (subordinating everything else) increased the factory’s throughput resulting in meeting delivery commitments and increased profitability. The novel twists and turns using threats of plant closure, downsizing and even a marriage crisis to keep the reader engaged, all the while providing simple illustrations on how to utilize the Theory of Constraints methods. With today’s focus on Lean concepts, the TOC is re-emerging as a useful tool worth consideration. A key outcome of focusing on value chains and system flow is and should be about maximizing throughput. 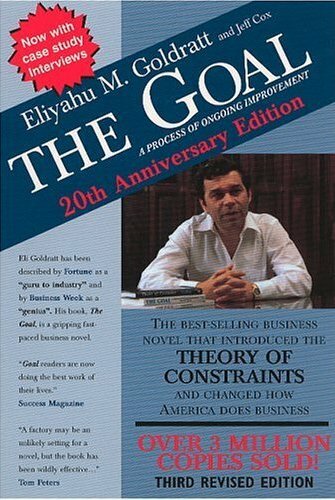 Goldratt’s “The Goal” offers the reader an easy to understand view into using the Theory of Constraints. Anyone who is new to the method or would like an enjoyable refresh of the TOC concepts should read this book!